It is one of the most popular arts. The clients are church and nobility, the same as during the Renaissance. Sculpture is the vehicle to express different religious believes and it can also be a way of showing and advertising power. Many works are located in public places such as squares and fountains. Baroque images multiply the points of view from which they can be seen. In general, they tend to open structures, with complicated lines, being the diagonal the most commonly used. Artists demonstrate interest for the effects of light and in order to achieve this aim they give different treatment to the surfaces or even resource to breaking the wall in order to get the light they want for a deter effect. Materials suffer a change too. Even when white marble continues being the most commonly extended, there are several works in which different materials are combined. Anything can be used in order to achieve spectacle. Gestures are grandiloquent and characters are depicted with human treatment. Even mythological and religious images are full of humanity and passions. Technically, volumes are perfectly organised as to offer the desired effect. Other characteristics are: taste for tension and drama, that leads the authors to represent only moments of maximum tension. In addition to this, they include violent contrast of light and shadows. Related to the typology, it is very varied, including relieves, portraits, equestrian portraits, allegories, mythological stories, religious, fountains, pantheons and, in the case of Spain, Easter sculptures. 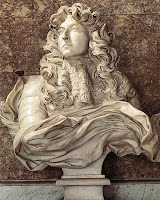 There are regional differences, being the Italian Bernini the most reputed sculptor of the Baroque period. This artist was formed as a sculptor in his father workshop where he entered in contact with Michelangelo’s work and the collections of Greek-Hellenistic sculpture. He worked in Rome, under the patronage of different popes. His style evolved from the tormented images of the Mannerism to images in which he capsized the physical movement as a result of the action he was depicting. It is a style of great dynamism and dramatic intensity of great technical perfection. He produced all the possible subjects, ranging from the mythological to the religious, passing by the portrait, the allegory or the funeral monument. As an urbanist he also projected and produced ornamental fountains in Roman squares. Examples of his works are: Apollo and Daphne, David, Ludovica Albertoni, Sainte Therese Ecstasy, Fountain of the Four Rivers, Tomb of Urbano VII. In France, there are two reputed authors. Girardon worked with a quite classical conception. He produced fountains, as Apollo Tended by Nymphs, and Pantheons, such as that of Richelieu. Puget made an impassioned work in which he expressed physical vigour and emotional intensity, as in Milon of Crotona.